“If government finds merit in this survey, they can commission a bigger following the same parameters,” he adds. The districts for study were selected randomly from the list of districts that had high rural population and villages that had high dependence on agriculture, says Kumar. Over 11,000 interviews were conducted for the report, which included one female and one young member of the respondent household. The idea was to have insight into the socio-economic conditions, expectations and hopes of the farmers to understand what is ailing them. The report says that benefits of government schemes and policies are being mostly given to big farmers having landholding of 10 acres (4.05 hectare) and above. Only 10 per cent of poor and small farmers with average land holding of 1-4 acres (0.4 to 1.6 ha) have benefited from government schemes and subsidies. The farmers blamed the state and Central governments for their present condition as 74 per cent of those interviewed alleged they do not get any farming-related information from officials of the agriculture department. Farm Pay Commission, public distribution system and resisting corporate farming. Farming is considered to be a non renumerative profession in india, it bears the black tag of pushing many peasants to suicide. There are very uncharitable arguments such as Ã”Ã‡Â£indian farmers cannot modernize or mechanise agricultureÃ”Ã‡Ã˜, Ã”Ã‡Â£we need corporate farming or contract farming to augment productionÃ”Ã‡Ã˜ and Ã”Ã‡Â£government should completely stop farm subsidiesÃ”Ã‡Ã˜ . Propaganda continues like people need to move to other sectors of employment such as manufacturing and services. We are already in a scenario where the current life standard of masses does not demand increase of Industrial production.It is a stellar fact that nothing is as labor intensive as farming. When we pass through times of jobless economics, it is worth considering how to give employment to every one. In Indian context, answer is farming. Study conducted by many agencies point out the urbanization is happening in a rapid pace and people are leaving their impoverished villages to city for better opportunities. It is worth mentioning here that cities due to structural problems of itÃ”Ã‡Ã–s people management has become heaven for few and hell for many. People who leave the farm land to city essentially fall into the low economics category and ends up leading a Ã”Ã‡Â£low qualityÃ”Ã‡Ã˜ life. When we talk about stopping urban migration, the first thing to be done is to make farming attractive. There are ways such as scattering production zones across land , but due to many factors such as lack of infrastructure- they bear a tag of Ã”Ã‡Â£not nowÃ”Ã‡Ã˜. All this facts and propaganda actually hints at a solution of Ã”Ã‡Â£corporate farmingÃ”Ã‡Ã˜. India as nation has suffered enough for allowing greedy corporates to enter to crucial sectors .we can just think Ã”Ã‡Â£gas priceÃ”Ã‡Ã˜ as an example. There are many lies propagating like Ã”Ã‡Â£investments in land will increaseÃ”Ã‡Ã˜, Ã”Ã‡Â£new technologies will be deployedÃ”Ã‡Ã˜, Ã”Ã‡Â£modernization of agriculture will happenÃ”Ã‡Ã˜, Ã”Ã‡Â£innovative seeds (read GM) will be used for bumper cropsÃ”Ã‡Ã˜ etc etc. As the voice of working class and peasants, vanguard party in india should consider these steps as the preparation for introducing Ã”Ã‡Â£ corporate farmingÃ”Ã‡Ã˜. Decks are getting cleared one by one, last one being Shri Moily allowing of GM trials. In Simple terms, idea goes like government awarding a salary for a farmer in exchange of his promise to deliver minimum quantity of goods to government system. An Example would be government awarding 10,000 rupees per month to a farmer for producing 1 tonne of potato. The goods procured like this can be pumped to public distribution system, which is in a paralyzed state. This step can promise a sure shot defence against retail food inflation which is untamed and puzzling economists in india. There can be additional incentives for promoting pesticide and chemical fertilizer free farming. Steps and thoughts in this direction would drastically stop urban migration, raise quality of soil and increase quality production and intangibly will increase health of nation. Working class and Peasants should unitedly place Ã”Ã‡Â£Salary for Minimum ProductionÃ”Ã‡Ã˜ in public domain as the solution of farm crisis in india. Very interesting article. Agriculture is the backbone of the Nation. Norman Ernest Borlaug Ã”Ã‡Ã´ the legendary American agronomist once commented, Ã”Ã‡Â£Man's survival, from the time of Adam and Eve until the invention of agriculture, must have been precarious because of his inability to ensure his food supplyÃ”Ã‡Ã˜. Men have had always fought against nature and all odds to satiate that one universal need Ã”Ã‡Ã´ the need to ensure his food supply and making his family food-secured. Procurement of food is one of the bigger challenges that third world countries like India face. This is despite of the fact that India today ranks 2nd in the world in agricultural output. According to the World Bank standard index of international poverty threshold of $1.25 a day, close to 42% of the total Indian population lives below the poverty line. Agriculture in India is the largest economic sector. Farm output in India accounted for 14.6% of the GDP during the fiscal year 2009-10. But the country is facing severe shortages in food supply resulting in continued inflation and increase in food prices. The countryÃ”Ã‡Ã–s population is growing faster than its ability to produce. The sectorÃ”Ã‡Ã–s competitiveness is largely affected by overregulation of agricultural trade resulting in increased costs, price risks and uncertainties. The lack of infrastructure development in this sector especially in the rural areas beggars description. Inadequate irrigation facilities, lack of access to technology to improve efficiency in agricultural practices, poor road condition, lesser supply of electricity etc are key issues that are holding back the sector. The country spends only 0 .3% of its agricultural GDP in Research and Development. There is no incentivized framework for sustainable water management and irrigation facilities. 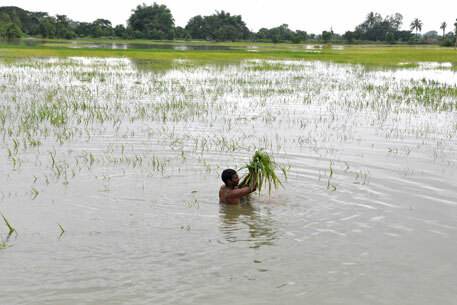 The farmers solely remain at the mercy of the rain Gods (good monsoon) for better yields. One of the primordial problems of the sluggish growth of Indian agriculture is small field sizes. Approximately 59% of the operational holding of the country have sizes less than 1 hectare. While green revolution states like Punjab and Haryana have a much better holding size of more than 4 hectares, regions with dry land and having poor reception of monsoons find it very difficult to better their produce. Though there is scope of precision agriculture to substantially increase the yields of crops, rice and wheat, but inadequate infrastructure and lack of technological expertise is a major roadblock to move towards scientific ways of tackling these challenges. The rain fed and dry land regions see high level of subsistence farming. Consequently these farmers rarely do purchases in the marketplace thus consuming their own produce. Some solutions: Encouraging entrepreneurship amongst the farmer community by educating them about farming processes, providing marketing support to sell their yields directly in the market, helping them get access to credit and capital, newer technologies, encouraging non-farm activities, serving better amenities like electricity, water and helping skilled farmers get employment in the labor markets etc are all immediate measures the Govt. needs to take to revive the sector. It is clear that youth are not at all interested in agriculture. Unless we teach our kids the importance of agriculture rather than only maths and sciences, which is to help those outsourcing companies than us, even remaining 24% prefer to migrate to cities. “The continued flight of capital from farms, lack of profits, fragmentation of land, rising input prices and pressure lobbies like food security and Swadeshi, have nearly made it impossible to sustain farming,” said Sharad Joshi a farmer and a member of Rajya Sabha till July 2010. He was a farmer from Satara, Maharashtra and even said that marginal and small farmers must leave farming and migrate to cities. This was in desperation as his ideas were unacceptable then! A lot of water has flown under the bridge about how farmers can sustainably conduct agriculture and arrest migration of their youngsters to urban areas. There is a solution for every farmer. We need to put one's shoulder on the wheel. We should not expect the Government to solve all the problems. Governments can only fill in when a common person cannot accomplish, tasks that are huge in size, expensive and complex. For instance, road connectivity from villages to markets to reach the markets, a storage facility for crops to keep crops protected and hedge the price, irrigation to reach every land in the village to move away from rain-fed farming, making government purchases for distribution to fair price shops from marginal farmers to realise the worth of his work and realising the MSP and equity with big farmers. The rest must remain in the farmer’s domain. Let us examine how this can be achieved. To attain good growth in any production oriented unit, four factors of production is essential. Applying this to agricultural operations, land, labour, organisation and Capital are vital. Small and marginal farmers have the first two but the lack the others. Entrepreneurs have the other two factors. Enjoining entrepreneurs and farmers can address the issues of agriculture effectively and sustainably. It is established that marginal farmers cannot conduct agriculture all by themselves because the challenges before them are formidable. They cannot independently carry on with farming on their lands to create a sustainable vocation, as challenges are beyond their capacity to resolve. Hence farmers should pool their lands without dispossessing their title and enjoin with a group of professionals who will bring capital, usher in technology, value-addition with marketing and bring in the capital. This group must form a Farmer Producer Company to give it a legal and operational convenience under relevant law. Equity shares to farmers based on the value of their lands and for professionals based on the capital contribution in cash will collect the entire four factor’s of production to yield the best result. 1. Professionals can make the best plan based on soil, water and markets. 2. Farmers will work for wages like an Industrial worker for the entire year. 3. Profits (after providing for reserve) will go as dividends to shareholders at the end of the year. 4. The accumulated reserve will serve for community building education and health. 5. Those without lands can also be gainfully employed. 6. One good startup will ignite passion in all villages in the country. 7. The government need not spend money on subsidies. 8. It can spend money on irrigation, power and road building, as no subsidy is required. This appears to be the only way to resurrect marginal farmers in India and perhaps in all those developing and underdeveloped countries in the world.